I remember the first time I had Prawn Saganaki. It was on the beautiful island of Aegina, cooked by the sister of a dear friend for their Fathers 90th birthday party. I had to move the dish away from me or I would have eaten the lot. I have looked many times for the recipe but have struggled to find it. There are some on the internet but, somehow, the ingredients don’t seem to marry with the taste I remembered. Recently we went for a week in Stalis, Crete. I lost count of how many times I ate Prawn Saganaki or Mussel Saganaki while I was there. The most wonderful of all was served in an ouzeri called Tsourlis, almost next door to the apartments where we stayed. They made their Mussel Saganaki with fresh mussels and it was absolutely to die for. I had an idea in my head of the ingredients and was delighted when I cross-referenced this with the recipe in my very old Greek cookery book written by Rena Salaman. Rena is a guru of traditional Greek cooking and, although this little paperback does not include pictures, the way she writes about her food and the places she remembers eating them is so vivid you feel you can almost taste the dishes she is describing. She does not call her dish Prawn Saganaki but ‘Yarithes Yiouvetsaki’. 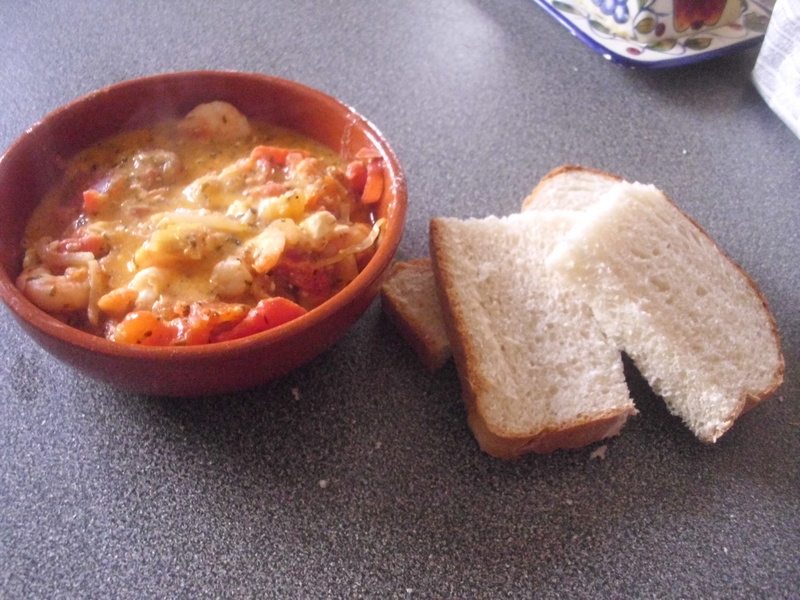 The dish is exactly the same as the ones I have tasted – prawns baked in a fresh tomato and feta cheese sauce. Wonderful on its own with chunks of fresh bread to mop up the sauce. Rena’s book is simply called ‘Greek Food’. It was published in 1983, not sure if there are newer publications. The ISBN IS 0-00-636467-5. If you want to read about wonderful places in Greek and maybe relive some memories, or simply want to make good Greek food, then this book is a must. Saganaki (Greek σαγανάκι) refers to various Greek dishes prepared in a small frying pan, itself called a saganaki, the best-known being an appetizer of fried cheese. Heat the oil in a frying pan then add the onions and fry over a lo-medium heat for about 10 minutes or until the onions are soft but not coloured. Add the oregano, wine and tomatoes then continue cooking for 5 minutes until the tomatoes start to break down. Season, add the parsley then crumble in the feta cheese. Mix well, bring to the boil then remove from the heat. In the meantime bring a small pan of water to the boil then add the prawns and cook for 2 minutes until turned pink. Be careful not to overcook as they will go hard. Put the prawns in an ovenproof dish and cover with the sauce. Cook in the oven for 15 minutes. Serve with chunks of crusty fresh bread. ← Potato, asparagus and mint salad – absolutely divine!